When the weather starts to turn, I just want to have every meal outside. Picnic table, park bench, some imaginary porch that I don't have yet. Longer days and tons of sunshine just make food taste better, I think. It also reopens an entire genre of food that pretty much gets shelved from September to March: barbecue. Now of course the barbecue world for vegetarians is a little less than typical, but no less satisfying in my opinion. And one thing no outdoor gathering is complete without is baked b eans. They were always one of my favorite side dishes as a kid. But if we're not going to pair these next to other classics like mayo-laden potato salad and short ribs, then what? 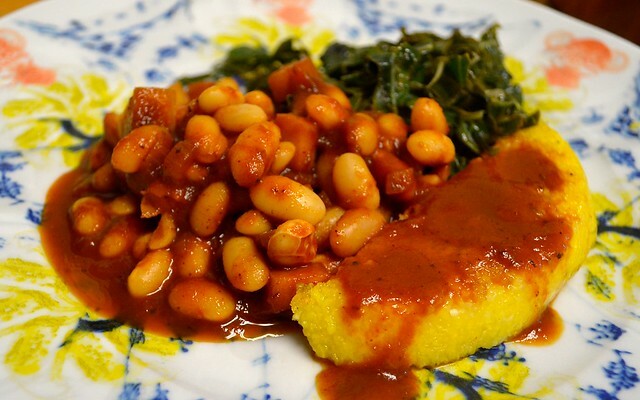 Well, what could go better alongside some sweet and spicy white beans than a helping of crispy polenta? A perfect combination that is easy enough for dinner tonight (given that you've soaked your beans already, which you did, right?). The inspiration for these comes from my continued favorite food-makers at Thug Kitchen. It's just not getting old. Start by sifting through your beans to weed out any weird or non-bean pieces (a pretty common occurrence, actually). Place in a large bowl or pot and completely cover with water, about five cups, and soak overnight. Forgot to soak? Truthfully, you're better off soaking them now and waiting until tomorrow. I know, the queen-of-not-waiting, but it's really the best way to guarantee properly soaked/cooked beans. A cheat method is to bring them to a rapid boil for 1 hour, but I've never had a ton of success with this route. Things may, however, turn out differently for you! 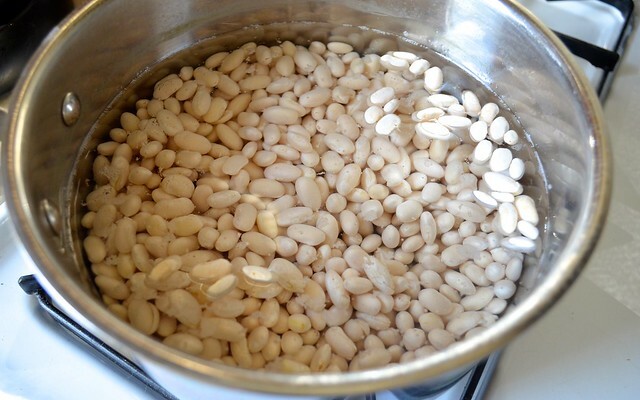 Anyway, if you did soak ahead of time, congrats and moving on: drain your beans. In the same large pot, heat your oil over medium heat. Add your onion and sauté until it starts to brown. Add your garlic, smoked paprika and salt and pepper to taste and continue cooking for another minute. 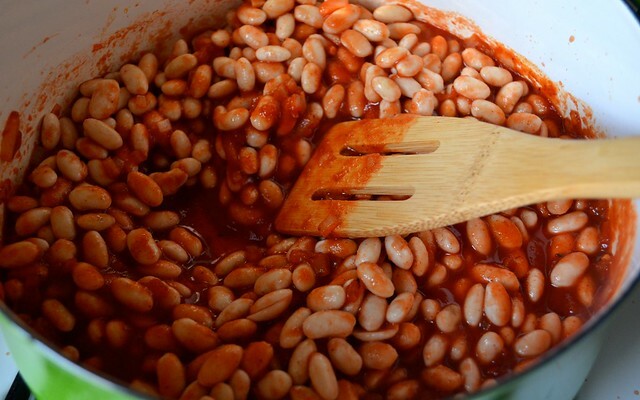 Add your beans, tomato sauce, molasses, apple cider vinegar, brown sugar and soy sauce. Stir everything together and bring to a light simmer. Once it starts bubbling, add your broth. Keep simmering until your beans are close to tender (think a little bite, but not chewiness). Depending on how long you've soaked, this should take about an hour. When you've reached a sort-of al dente bean consistency, add your apple chunks and simmer for 30 more minutes. Once you've reached the point where you can add the apple, in a small saucepan bring your 1 1/2 cups of water to a boil. 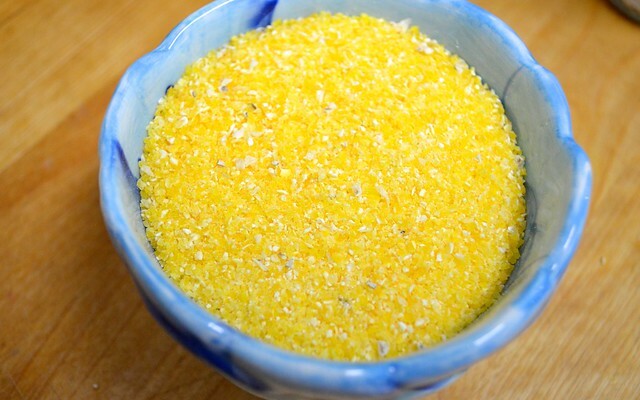 Add your polenta, salt and pepper and reduce to a simmer. Stir together and cook for 3-5 minutes or until thickened. Immediately stir in your margarine and transfer to a bowl, pressing down. This will help mold the polenta so it can be cut into slabs. Once almost cooled, flip the bowl and cut your mold into serving size pieces. 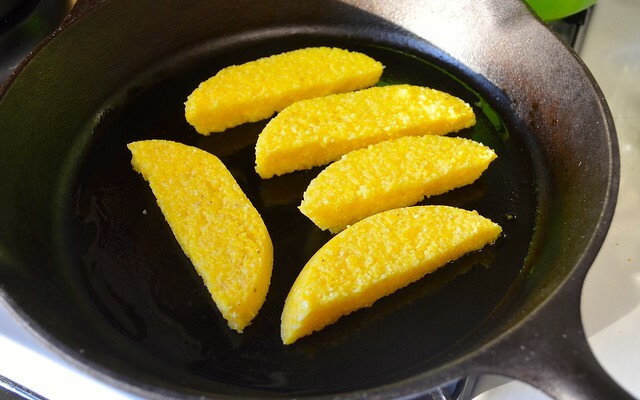 In a lightly greased small cast iron or on a stovetop grill, add each slice of polenta side-down until crisp. Flip and repeat until all pieces have been crisped. 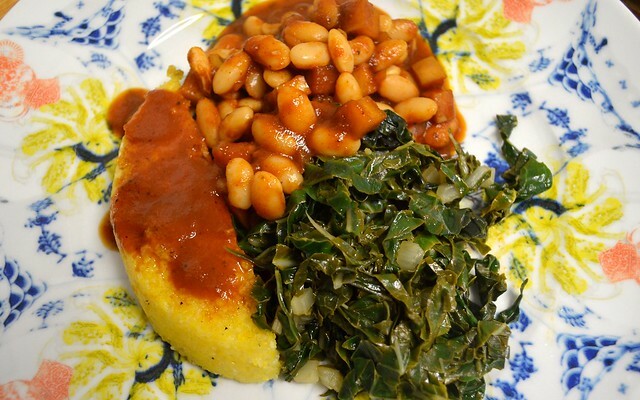 Serve alongside heaping helpings of the apple baked beans, add a little extra barbecue sauce to the polenta. Also works great with some bitter greens, like Swiss chard with some onion and a little squeeze of lemon. Summer, we're ready for you! 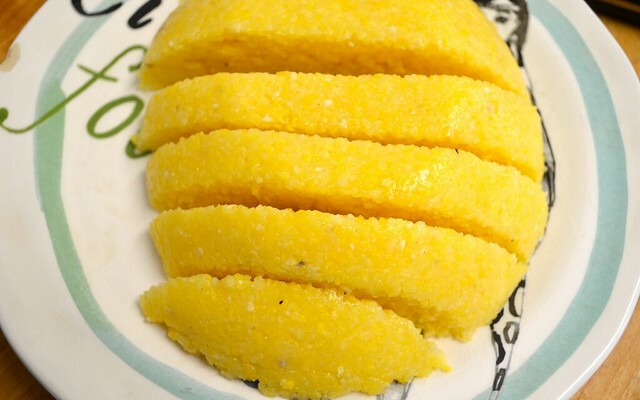 Want your polenta in more ways than one? I know what you mean. White beans with maple carrots? Try this one. Is your summer all about burgers? These black bean quinoa patties will change everything.